You'll think you died and went to heaven when you taste this chocolate caramel tart. Decadent; with a caramel and honey nut layer. More easy homemade dessert recipes at the end of the page. This delicious recipe is from Dorie Greenspan's cookbook "Baking - From My Home to Yours." QUICK NOTE: You have to work quickly once the sugar caramelizes, so you should have all the ingredients for the caramel measured out and at hand before you start. Also have a medium heatproof bowl at hand to hold the hot caramel. Meanwhile, in a skillet over medium heat, sprinkle 3 tablespoons of white sugar and when it melts stir it with a wooden spoon and add another 3 tablespoons. When that sugar is melted, add the remaining 2 tablespoons of sugar. The sugar in the pan may already have started to color and that's fine. Stir in the corn syrup and boil until it reaches a deep caramel color. If it starts to smoke, don't worry because that's normal. Stand back from the skillet and stir in the butter and salt (if you are using it) because the caramel will bubble furiously and may spatter. When the butter is in, add the warm cream - the caramel will bubble furiously again. Lower the temperature just a bit and let the caramel boil for 2 minutes. The caramel should be at 226 degrees if you want to check it. Pour the hot caramel into the heatproof bowl and set aside. To make the ganache for this chocolate caramel tart, put the chopped chocolate in a heatproof bowl. Bring the cream to a boil and pour half over the chocolate and let it sit for 30 seconds. Whisk mixture together in small circles (very gently) starting in the middle of the bowl and working your way out into larger circles. Pour in the remainder of the cream and blend it in with the chocolate using the same circular motion. When the ganache is smooth and shiny, stir in the butter piece by piece. Don't stir the ganache any more than you must to blend the ingredients - the less you work it, the darker, smoother and shinier it will be. Cover the ganache with plastic wrap and form a tight seal; set aside. To assemble, us a small spatula and stir the peanuts into the caramel. If the caramel has cooled and is too thick to spread easily, gently warm it in a microwave in 3 second increments. 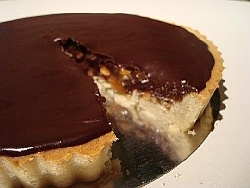 Spread the caramel mixture over the bottom of the tart shell; you will have a thin layer. Chill for 15 minutes to set. If the ganache has thickened and is no longer pourable, warm it in 3 second increments in a microwave. Rap the bowl to break the surface bubbles and pour the ganache over the caramel and jiggle the pan to even it out. Refrigerate for 30 minutes (no longer than that), then keep the chocolate caramel tart at room temperature until serving.